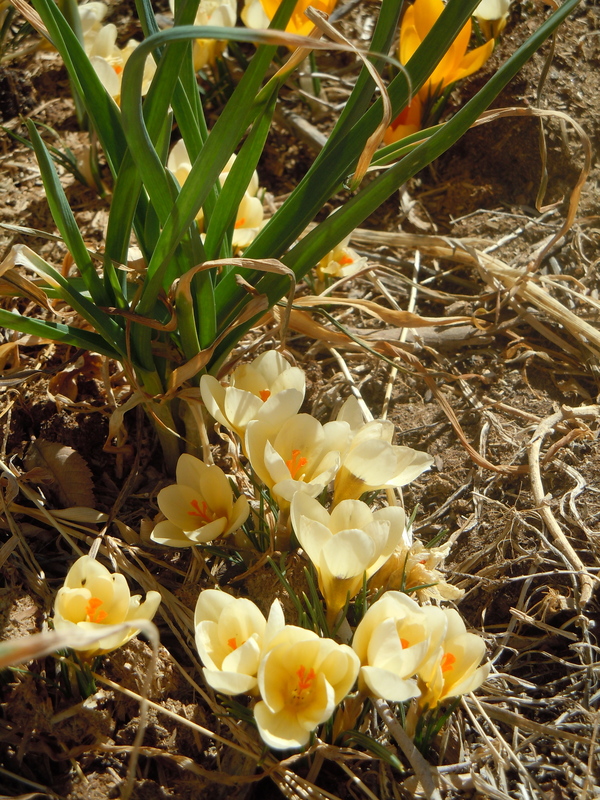 I’m not a winter person, so wherever I move, I always plant a patch of the early little species crocus “Cream Beauty” in my garden. When I see the first glowing blooms, I’ve officially survived another winter. Last fall I coated all my “greens” beds thickly with horse manure, and dug it in as soon as the ground thawed in early February. Fresh manure needs to go on in the fall, but you can apply well-aged manure or finished compost now. Now the beds are ready to plant, and I put in three kinds of lettuce, several types of mustard, two kinds of spinach, snap and shelling peas, and a wide assortment of chicories, both leaf and heading. It’s important to get them in early so that they don’t fry in overly hot summer sunlight. Chard, parsley, and potatoes will be planted within the next week or two. Leeks and scallions were started in seed trays last month, and the multiplier onions, garlic, and shallots planted last fall are sprouting. I planted grey shallots once and didn’t find the bulbs useful- too small and too much work to peel- but they provide generous cuttings of sharp shallot greens every spring to season salads and soups. They are like chives but with a distinctly stronger flavor. Every year I try a few things that are completely new to me, and one of my newbies this year is bladder campion, which, according to the catalog, provides young greens that taste something like green peas. It’s a common weed in wetter parts of the country, but here it needs some shelter and encouragement. Bear in mind that many plants which need full sun elsewhere prefer some shade from our high-desert sun. If you fail the first time, as I did with bladder campion last year, try giving a little afternoon shade. Don’t forget to plant more peas than you need so that you can cut the sweet young greens for spring stir-fries. If you’re going to try chickens this year, build the coop and make a brooder set-up now, BEFORE you buy the adorable baby chicks. I’m going to try a few meat chickens this year, so I’m building a large open-bottom cage to keep them in. It’s my first effort at carpentry, and I don’t think that there is a perfect 90 degree angle anywhere in it, but the chickens are unlikely to care. Make your chicken construction sturdy and raccoon-proof, not beautiful. Gardening is a natural process, with all the entropy of any other natural process. Success does not pile upon success in an automatic fashion. Our freakishly cold snap is likely to result in some garden disappointments. My artichokes all seem to be dead, a sad event because they are offshoots of the first plants I grew from seed, many years ago. But that’s a reminder that nature is under no obligation to respect our sentiments. If you are very fond of getting your own way, gardening might not be for you. Nature offers some consolations too, like the glut of big brown eggs with deep orange yolks flowing out of the henhouse. There are a million ways to enjoy them, but while I’m waiting for the spring bulbs to bloom I enjoy eating what I think of as Daffodil Salad. The name comes from the colors, which remind me of the exquisite Poet’s Narcissus. Please know your edible flowers if you use them, and remember that daffodils are NOT edible. To make a main dish, put three eggs per person in cold water, bring to a boil, simmer 10 minutes, and cool quickly in cold water. If you have your own hens, the eggs need to be at least a week old to peel cleanly. With store eggs this is seldom a problem. The ten-minute simmer gives yolks as shown, just barely solid in the center and a rich orange. Peel the eggs and cut them in half. Put the amount of salad greens you prefer in a big bowl; I use about three good-sized single handfuls per person. Toss with the dressing below or your own favorite vinaigrette. 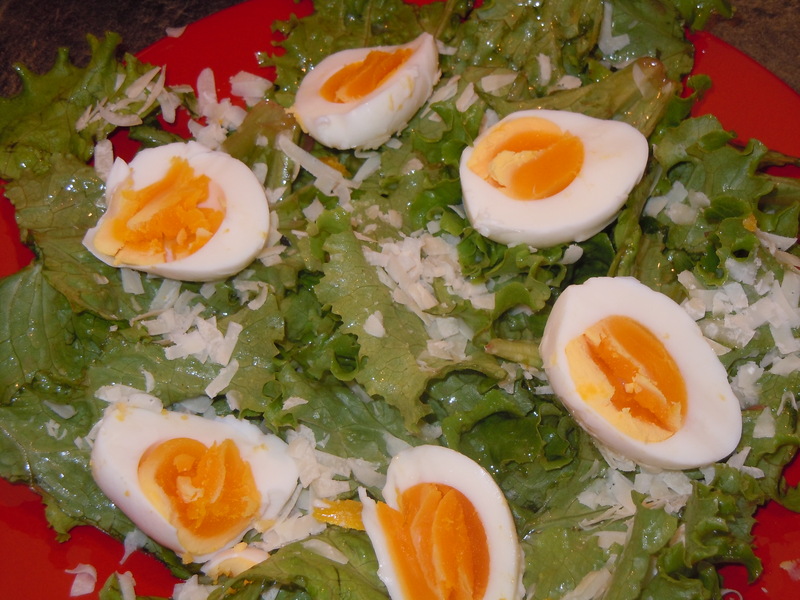 Pile on plates, top with the egg halves, and drizzle a little more dressing over the eggs. Scatter on some thin shavings of your best Parmesan and enjoy. half a teaspoon of salt, or to taste. Chop the shallot bulb, scallion, or green garlic bulb very finely and marinate in the lemon juice for fifteen minutes, with the salt added. Don’t skip the marinating step. After fifteen minutes stir in the other ingredients, shake in a jar, taste for seasoning, and use. Any not used immediately will last a day or two in the refrigerator.